Caitlyn Jenner has written a tell-all book, "The Secrets of My Life." Caitlyn Jenner called the “Keeping Up With the Kardashians” reality-TV show that introduced her to a new generation of fans “drama” and said she is "sorry" how her ex-wife Kris Jenner reacted on the show to Jenner’s new memoir. “I’ve never been so angry and disappointed in somebody in my whole life. I’m done. Done,” Kris Jenner, the matriarch of the Kardashian clan and the mother of two children with Jenner, said on the show, adding of Jenner, "Everything she said was all made up." In the book, Jenner writes that all his ex-wives learned at different times in their relationships that she was struggling with gender identity. Jenner first came out publicly as transgender two years ago and is now living as a woman. Jenner’s two daughters with Kris Jenner -- Kylie Jenner, 19, and Kendall Jenner, 21 -- also star on “Keeping Up With the Kardashians.” Though Jenner still makes appearances on the show, she said she did not watch Sunday night’s episode, in which she appeared alongside Kris Jenner. Jenner called her new book "extraordinarily honest" and acknowledged the backlash she may receive from writing the memoir from her own perspective. "It is my perspective and, obviously, when you do a book like that, you know, there’s different opinions," she said. "I have a lot of friends that know the truth and know what I’ve been through and know the whole situation." Jenner was seen by millions raising Kendall, Kylie and her four stepchildren -- Kourtney, Kim, Khloe and Rob Kardashian -- from Kris Jenner's marriage to the late Robert Kardashian on “Keeping Up With the Kardashians." 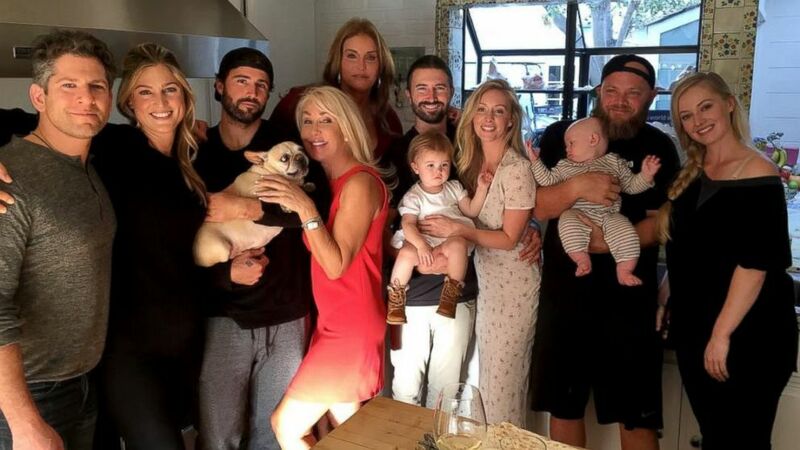 Jenner said the reaction of all of her children, which includes four older biological children, to her transition has been "absolutely great" but their communication has wavered. "When you go through something like this, you always hope for the best and it could not have been any better," Jenner said. "My kids have been absolutely great. Now, you’re certainly closer with some than you are with others but that’s always in a relationship." She added, "I don’t see them as much as I used to see them, obviously, so you wonder, is that because of what I went through? Or is it just because, you know what, I raised wonderful kids?" Jenner, who has 11 grandchildren, said she raised her children with an entrepreneurial work ethic and now they all have their own lives, including children and "successful jobs" that require them to "travel all over the world." (Caitlyn Jenner/Instagram) Caitlyn Jenner, center, is pictured with her family in this undated photo she posted to her Instagram account. "That’s also the reason why I don’t see them quite as much," she said. "Any parent feels the exact same way." All six of Jenner's biological children declined ABC News’ requests for an interview. Caitlyn Jenner was, as Bruce Jenner, hailed as an Olympic icon. Jenner revealed she had never met a transgender person before publicly outing herself as transgender in an interview two years ago with ABC News' Diane Sawyer. "It has been a learning process," Jenner said of the time since. "I have met some of the most wonderful people in this community who have been through such difficult times in their life and they've overcome these things." Only a small percentage of transgender people go on to get what is called the “final surgery” or “gender confirmation surgery.” Jenner reveals in her book that she had the “final surgery” in January 2017. In her 2015 interview with Sawyer, Jenner said she wanted to "change the world." Two years later, Jenner said she is proud of the conversation she started and is committed to continuing that conversation. "I think I certainly have over the last two years opened up the conversation about a very marginalized community and I’m very proud of that," Jenner said on "GMA." "I really had no choice but to come out publicly just because the tabloids and the media were just destroying me for so long." She added, "I’ve just worked over the last two years, been misunderstood, made a lot of mistakes but I worked hard to try and make a difference for our community and will continue to do that." "The Secrets of My Life" is available in bookstores and online Tuesday. ABC News' Lauren Effron, Eamon McNiff, Tess Scott and Christina Ng contributed to this report.